Indie powerhouse, The Fratellis, are back this year with their anticipated album, ‘In Your Own Sweet Time’. The Scottish trio also embark on a UK tour set to kick off this March, starting things of at the Liverpool Olympia, on the 23rd. 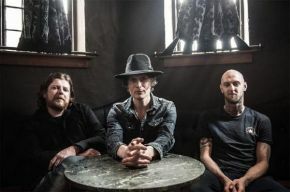 We caught up with lead singer and guitarist, Jon Fratelli, who told us his feelings on the new material, and what it’s like to play live around the country. This is about to be a busy year for The Fratellis – something that doesn’t surprise you as soon as you listen to their new song ‘Stand Up Tragedy.’ Still keeping in touch with their rock roots, this new release is impossible not to dance to, complete with a tantalising feel-good hook and wit-filled, tongue- in-cheek lyrics that have become synonymous with the band. ‘The Next Time We Wed’, gushes an electronic feel that mixes effortlessly with their signature indie sound. With possibly the catchiest chorus of the year, this song is meant for massive things and deserves to be the summer anthem of the year. This album breeds a new sound for the band, while still being recognisable as The Fratellis, it’s clear they’ve taken a stronger, bolder chance with their music that is paying off, with a conscious maturing but with also somehow incorporating even more fun and dance into their songs, something that the band are proud of. ‘The thing about this record is that we’ve gotten closer to producing the type of music we would want to listen to. There’s nothing on this album that I don’t really, really enjoy.’ Jon told us. As with previous albums such as the iconic Costello Music, the band decided to team up with six time Grammy winner and Mercury Nominee Producer, Tony Hoffer. (Beck, The Kooks, Belle & Sebastian) which seems to be a match made in heaven for the boys. The centre of the Fratellis world seems to be filled with a constant need to perform live to their fans, and have expressed their love of touring the UK. As their loyal fans from Liverpool can’t wait for their return, it seems the feeling is mutual. 5/5. Best album the band has done. Hands down. Give ‘The Next Time We Wed’ a listen and you’ll get it.